Heat gas or charcoal grill. If using bamboo skewers, soak in water 10 minutes; drain. In large bowl, beat vinegar, honey, mustard, pepper and 1/2 teaspoon salt with whisk. Beat in 1/4 cup olive oil in a thin stream. Add coleslaw mix and apple; toss to coat. Cover and refrigerate. In large microwavable bowl, mix quartered potatoes and water. Cover; microwave on High 8 to 10 minutes, stirring once, until just tender when pierced with a knife. Carefully uncover and drain; set aside to cool. In large bowl, mix 1/4 cup olive oil, the barbecue seasoning and 1 teaspoon salt. Add potatoes and onion; toss to coat. On each of 4 skewers, alternately thread potatoes and onion, leaving 1/4-inch space between each piece. In same bowl, place chicken; toss with remaining oil and seasoning in bowl. On remaining 4 skewers, thread chicken. Place kabobs on grill over medium heat. Cover grill; cook 5 minutes. 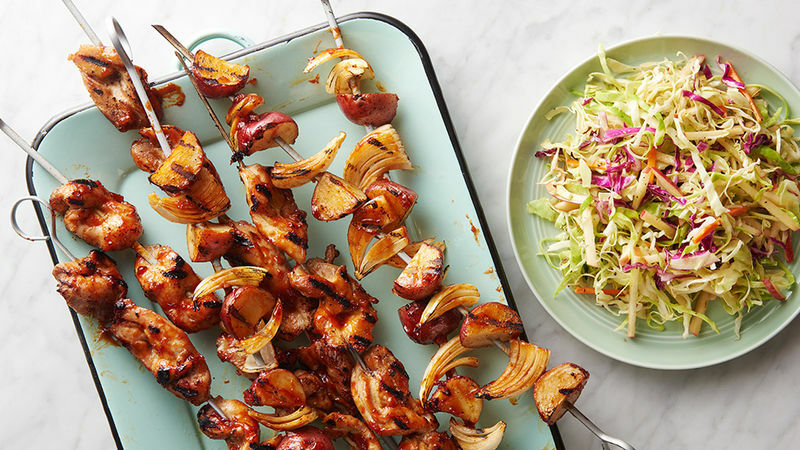 Brush kabobs with barbecue sauce; turn, and brush other sides with sauce. Cook 3 to 6 minutes longer or until chicken is no longer pink in center and vegetables are tender and browned in places. Serve with slaw. You can make the slaw in advance; cover and refrigerate up to 4 hours. Potatoes can be quartered, covered in water and refrigerated up to a day in advance. Drain before using.